Please allow a few moments for the thumbnails in the gallery to load. For background on the trip, please read my whale watching trip report from the same vacation. 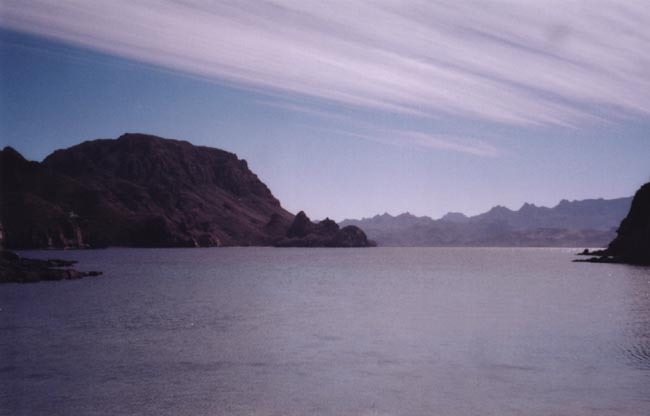 In February, 2004, I again ventured to Loreto on the Sea of Cortez for diving and whale watching. And, once again, we came during the off diving season, so our diving expectations were modest. Unfortunately, based on Baja Outpost's web page, we came to Loreto with only 3 mil wet suites, skins to wear underneath, and hoods and gloves. The web site states: "During the winter months, we recommend diving with a wet-suit. However, we have seen many brave Northwest and Canadian divers diving in the heart of winter with nothing but a bathing suit." I figured that, as a hardy Alaskan, a 3 mil and a skin would be sufficient. When we told them what we'd brought, it was met with shock and the shaking heads in dismay, (as though we were fools). Not enough, they said, you need a seven mil suit! We'll rent them to you. Well, this made Larry and I a little grumpy, as we felt we'd been misled; if we'd known the water was that cold (58-60 degrees F), we'd have brought our dry suits. Instead, we were forced to rent theirs. Again, the web page states that the water temp drops only to 70 in the winter. Perhaps we should have been more careful in planning the trip, but I wasn't anxious to cart my dry suit down there. Consequently, the diving was chilly. After one day of blue and fin whale watching, Larry and I headed out in a panga accompanied by Captain Manuel and Divemaster Gil. We zipped over to Isla Coronado, dropped a few folks off on a beach, and came around the backside to Punto Lobos. The lions were bobbing about on the rocks, "barking" and eyeing us. We anchored, put our gear together, suited up and dropped into the frigid water. It was decidedly unpleasant when the sea crept up the back of my suit. Dropping beneath, we followed a wall out to the sea lion haul out and were greeted by several California sea lions swooping in. They were tiny!! The big males were hardly the size of the juvenile Steller sea lions that play with us in Alaska and the juveniles were but a few feet long. They were far more slender and delicate looking than ours, and faster. And they vocalized under water like they did on the surface! The males had a funny chocolate brown top knot on their heads. While our lions typically hang suspended in the water column to watch us (in addition to buzzing about) these guys whizzed by so fast I could hardly get a look, let along a decent photo. Of course, this was only our second time with California sea lions, so I shouldn't make generalities. Leaving the haul out area, we headed farther down the wall where it was hung with soft corals in pastel colors drooping elegantly in the current. The visibility was quite poor, the water literally alive with tiny shrimp-like organisms. These were not merely schools of larvae passing by; the entirety of the water column was inhabited. It was fascinating, despite the limited visibility, and I was mesmerized by the tiny wriggling organisms caught in the arms of a jellyfish. Not far away, I knew a fin whale was feeding, and imagined him swimming by engulfing the plankton. Tunicate chains swam through the murk as well, mercilessly stinging my lips. On the way back, I ignored the warnings about male sea lions and failed to show deference when one came by. He turned and swam toward me, rushing straight toward my head and snapping his jaws just a few inches from my face before dashing to the surface. It was the only time I've felt remotely threatened by a lion. By the time I got to the boat, I was freezing. We took our surface interval there in the cove with the steady wind pounding on us the entire time. If I wasn't cold enough already, I became thoroughly chilled and barely mustered the will to make a second dive. We dropped off the boat on one side of a nearby point, (Frigatebird), and swam leisurely into the cove on the other side. Because of the wind, this was one of the few divable spots that day. The topography consisted of large boulders jumbled together, making protected hollows and little overhangs for fish to hide in. If I'd been warmer, I would have loved to explore them in more detail, but as it was I was content enough to swim along and enjoy the big picture. I only loosened up enough to take a picture when we found a couple of horn sharks. As soon as we were back aboard, we headed into the lee of the island for lunch. I barely got tolerably warm as I ate and the hot shower back at our room was heavenly. Temperature remained a surprising frustration during the trip. Baja Outpost's proprietor, Leon, said that this was the coldest winter he'd seen. It blew every day and turned desert cold at night. I remember only one hour of being well and truly warm. Before the trip, I'd imagined sitting out in the sunshine at the Outpost reading in the afternoon and losing the chill of winter in Alaska, but few places escaped the wind and I always had to wear a polar fleece pullover and sometimes a jacket when outside. On the water, I learned to bundle up in a ridiculous, Alaskan fashion to prevent precious body heat from escaping before we reached our destination. The next day we were scheduled to dive again. Facing another frigid day with poor visibility, I decided to try my luck with blue whales instead. Larry headed out with two newly-arrived divers to the same dive sites we'd visited the day before. The following day we went to Magdalena Bay to hang out with gray whales, so it was two days before I got back in the water. I was better prepared this time, bundled up, tried to stay warm between dives, and ultimately was much more comfortable. We dove Silhouette on Isla Danzante where Gil found me a tiny white nudibranch on the bottom. We saw several rays, a jewel moray and a large cornet fish hovering in a hollow. The visibility was no better, but the water was two degrees warmer. What improved the day's diving for me (over the first day of diving) was the switch to a dive site in the lee of the island for the second dive. As we motored north and around the tip of the island, we left the cutting wind behind and anchored up in a perfectly calm little cove where the sunshine warmed us during the surface interval. Big yellow hornets flew over from the island and shared our juice and bananas. After a pleasant rest in the sparkling sun, the five of us plunged overboard to swim around Honeymooner's Point. This was a very pleasant dive of rock piles interspersed with sandy patches. We met a horn shark sleeping in the open, (who actually swam several feet when we disturbed him), and Gil plucked a distraught trigger fish from deep within a fissure and held it by the tail. Toward the open water, a school of jacks flashed, but disappeared before I could get a better look. I found what looked like the ribbon-type nudibranch eggs, but they were hard and granular. Visibility was no better, though there weren't as many discernible organisms, but I was warmer. We lunched on a nearby beach and fed a pair of seagulls. The next day dawned windy. About ten of us at the Outpost were to go in one panga for the day's activities and we all marched down to the harbor to meet the boat after breakfast. We must have waited for an hour before it finally showed up, our backs to the stiff wind, wondering what had gone wrong. When it did arrive, we quickly loaded and were just idling out of the harbor when Leon's van came screaming down the breakwater, yelling for us to stop. The water was too rough, he said, and we'd have to go to Punto Coyote, the only sheltered spot in the area. We trudged back to camp, climbed into taxis, and met the panga at Puerto Enscondido for the short ride to the sheltered beach. Though the beach itself was cobbled rather than sand, it satisfied most of us. Some went beach combing, some snorkeled and some dove, right off the beach. Gil went down with some inexperienced divers, so Larry and I and the couple we'd befriended headed down on our own. We chased some large cornet fish and explored the boulders around the point. The visibility cleared somewhat deeper and we saw whole sections of rock made into forests of yellow-polyp black coral. Cortez angelfish approached us amiably and some areas swarmed with sergeant majors. We saw more small rays and I removed my glove in the hopes that one bullseye electric ray might take it upon himself to shock me, but he was undisturbed by my presence and ginger touch. On the way back, I caught a balloonfish and made it puff itself up, which I immediately regretted and apologized for profusely. The reluctance with which it used its defensive spines made me suspect that they blow up only when a predator actually tries to eat them (no doubt very effective in a predator's mouth). Again, it was a pleasant dive with a mild current, but nothing extraordinary. After we surfaced, I decided to forfeit the second dive (at the same site) in favor of taking a hike up the mountain behind. I scaled the steep scree slope in about ten minutes and looked down at the minuscule camp below, peopled with our panga, fellow guests, and about half a dozen tents of kayakers weathered off the Sea. Just beyond the point, the white-capped swells rose six to ten feet (I estimated) in wide arches out in the channel. My vantage point was a smooth saddle between two rocky spires which looked down the opposite side at a small rocky cove where the swells pounded against the shore. The drop was precipitous, the tiny cove surrounded by intimidating cliffs. One finger of rock jutted away from the cliffs and was aglow with a lone shaft of sunshine. At its peak, receiving the full brunt of the wind, was an osprey nest inhabited by its owner. As I watched, another osprey swept across the saddle from the direction of our beach, hovered for a moment about thirty feet above his nest, and dropped flawlessly atop it. A few moments later, one of the birds took off. Among the various exotic cacti that grew in the dusty red and beige soil, I discovered two small lizards. As much Steve Irwin as I've watched, I was still unable to capture one (which was probably just as well for the lizards), but it was exciting as usual to see reptiles (there are no reptiles to speak of in Alaska). As I slipped my way back down the slope trying to avoid as many spines as I could, I felt thoroughly warm for the first time all week. For the next hour I gulped water and let the sun soak in, looking forward to whale watching the next day. I did take my Sea & Sea MX-10 camera on each dive, although my photography urges were tempered by the poor visibility and lack of desire to move much, (less movement means less cold water entering my wet suit). I knew anything other than macro shots were more or less out of the question, so I came back with few pictures of fish. Consequently, I concetrated on invertebrates. Actually, I was quite surprised that even the macro shots turned out as well as they did. Hope you enjoy them.